If you are more interested in a higher-level management overview of Java EE 5, please check out the Java EE 5 executive Overview. If you are more interested in an in-depth technical overview of Java EE 5, please check out the Java EE 5 Technical Overview. However, these 2 seminars were designed to be loosely-coupled and minimally overlapping so that you get the full picture during these 2 days, first the big picture of what Java EE 5 is, what sort of applications it is suitable for, and what is involved; and then the more detailed picture of the presentation, business and persistence layer of Java EE 5. Of course, if you attend both days, you get an extra discount. In the two-day seminar, you will learn some of the key new features of the Java EE (Enterprise Edition) 5 platform and how it simplifies the development of enterprise applications. During the first day of this seminar, Stephan Janssen will present an executive overview of Java EE 5 by putting everything in perspective. 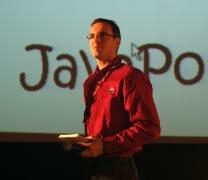 Stephan will explain (and compare) the many options for developing enterprise Java applications. During the second day, you will get more technical insight in the novelties of Java EE 5, in particular EJB 3.0, Java Server Faces and the new additions to support service-oriented development. Although this seminar is optimally "consumed" as a two-day seminar, it is possible to attend only the executive overview or the more technical overview.